Please tell me that I'm not the only one who has a 3 yr. old that is as obsessed with "getting married", being a princess, or dressing up, as much as mine is. Honestly... day in and day out, this chick is living in a fiarytale. lol. Can she just stop growing up now? I actually think that (besides just being 5 yrs. old) the Summer is making us a bit "sassier" then normal. Thank goodness for dance and swim lessons that are starting up again soon. I'm pretty sure that most of the time the "sassy-ness" is triggered by boredom. While they were all little it wasn't bad, but the second that they are old enough to be involved in anything... it takes a HUGE dip into the budget (times 3!) I'm wondering how all of these young families with multiple children keep their kids so involved in sports, dance, gymnastics etc... and STILL manage to buy groceries at the end of the month...??? Am I missing out on a secret? If so, somebody let me in... mmkay? In other news, I changed up our little window photo gallery display the other day with some more recent pictures. It makes me happy. The three year old "Going to the Chapel" epidemic has hit my home too! Love your posts, creativity and sense of humor. thanks for sharing your family with us! Sports has taken over our lives! After working all day, my evening job as chauffeur kicks in. Along with waitress, maid, laundress, etc...;-) And yes, activities can be expensive! I have two boys and a girl, and the boys run me ragged! My poor girl has been in limited activities because of our already insane schedule. I think she would love your girls though - she's 5 and full of sassiness. What a little doll she is. Cherish these days of sweet fantasy. 3? I say bring it! I don't think we should ever grow out of that ! What girl doesn't need a little ruffle and bling in her life, she is precious! And I love Sass #1 and Sass #2 too, you've got a fabulous crew!! Am I the only one who never dreamed of getting married!? Did I miss out as a child!? I have the cutest picture of my girl dressed up as a bride at about the same age. Well, six months ago she married her sweetheart and was the most beautiful bride. Memories of that little girl brought tears to my eyes ... her dream came true. Never lose that picture ... it will play in your mind on the day she does walk down the aisle. Ahhhhhhh! I'm relieved that my 3 year old isn't the only one who marries her daddy, her doll, and our dog all in one day! She also frequently leaves the house wearing tutus, crowns and gawdy jewelry! I've been told that a good imagination is a sign of intelligence!!! Girl, you might have some Double Trouble on your hands, but you definitely aren't alone. My four year old tells me all the time that she is going to marry "Daddy" when she's 10. She has everything planned out, even outfits for her stuffed animals...LOL. I guess my husband is the only decent man she knows, but it still freaks me out a little because I am NOT girly at all!!! Oh, she looks very cute in her dress and her glasses! Yes,kids are expensive! I only have one and with swim lessons, disney and local museum passes, part time daycare and planning on starting her on dance and piano lessons and soccer in a year I told my husband its time to save. I say they should tell parents to start saving for all of the kids activities first rather than college. Now I want to know is how I survived without all of these extra activities growing up. We just signed up for school today...$85 bucks. I only have one in school til next year. I have wondered the same thing about multiple kids in families! Love the window, by the way! Oh love the photo collage. You can come see nine gallery wall examples on my blog. Including one with a "Blessed" sign too. Honestly, my daughter's really don't talk about the marriage thing all that much. Maybe they do though. Hmmm....I'm going to have to really snoop on those girlies. Oh my goodness...kids are so expensive! But so worth it. :-) Love your photo collage window. I'll have to check out your tutorial. Before you know it...they will be grown up and gone. I have 4 daughters and they kept me busy with a lot of sassyness. They are now grown with children of their own and I miss those "carefree" days! Remember you don't have to have your girls in everything. We didn't have money to do much when they were kids and they turned out to be wonderful people. Many paid activities does NOT make a perfect person. I think in this society we've been caught up in doing it all. Take a deep breath, and enjoy doing what you can. And saying No to those you can't. Those sweet little girls will still grow up to be wonderful adults! Your kids are darling!! That video is so so cute! So cute! Your girls are just adorable! HA! So cute! My three year old is doing the EXACT same thing. The other day she told me and my husband she was going to marry Daddy. My husband replied, "But what about Mommy?" She paused for a second, looked at me and said, "What ARE you going to do Mom?" Gotta love this phase!! As for how to budget with multiple children....I have five and the way WE do it is that they only can do ONE thing at a time. They each get to choose what they want and then we go from there. Even so, it STILL gets crazy hectic sometimes. Also, sometimes if you have more than one kid in a class they give you a discount. Our gymnastics place did that and our dance lady does too once you have more than 2. Good luck and remember you are a GREAT Mom no matter how many things your kids ARE or aren't in! P.S. Love the photo gallery window. SO cute! ha ha ha she is adorable! As for your cute picture window.... LOVE it.... as a matter of fact great minds must think a like! 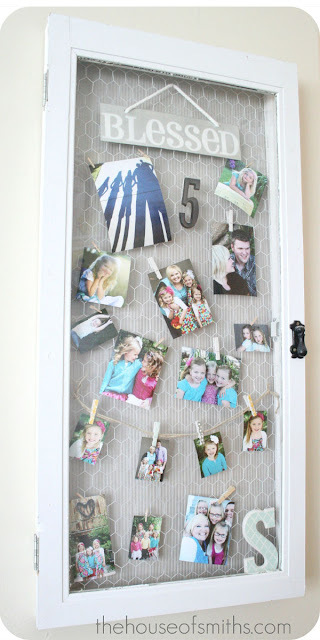 I did something similar for the Parade of Homes house that I just decorated! I kinda like yours better ;)Why did I use a hot glue gun to attach my chicken wire.... who knows my brain was scattered and fried ha! they are adorable! what's your secret on having them spend TWO days at home without being bored?? lol love the window too - so creative! Oh honey....hang on to your pants! I remember feeling the same way with dance, gymnastics, soccer, etc... BUT wait till they're teenagers and the cost of sports triples! Register teenagers for high school lately? Hundreds of dollars and if they play tennis? cheerleading? football? add on hundreds more! 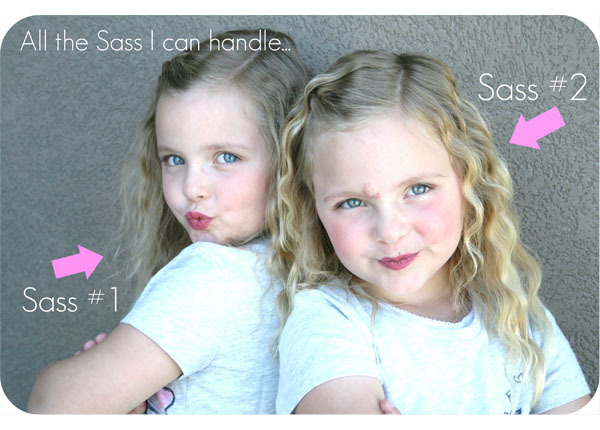 Enjoy those sassy girls...They're adorable! How adorable!! I don't have a little girl (yet) but this video is SO cute!! !